Sharon Kay answers “Yes” to Carol Adler’s question, Do You Really Need to Write a Book? “This information-packed primer is ‘just what the doctor ordered’ for anyone dragging their feet, as I have been. “It will lift you up, give you wings and teach you how to fly in the realm of the written word. 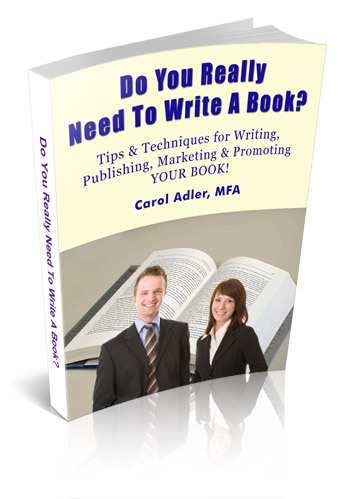 “Your instructor, Carol Adler, a master of writing, publishing and marketing books shares the depth of her experience in this power-packed guide. “It has now become a treasured and permanent volume in my personal library. It is a must-read! “As a previously self-published author, I feel blessed to have found a publisher like Carol Adler who loved my newest book as much as I did. “We decided to transform the original manuscript from non-fiction to fiction as she nurtured me through the re-write." “Her mastery of writing, teaching and editing, along with her spirituality and deep love raised to levels of which I had only dreamed. “In Do You Really Need to Write A Book? Carol holds your hand and clearly guides you through the process of writing, publishing and marketing your book. It is an excellent guide for the novice as well as seasoned authors. “The publishing industry has changed so drastically for the better since I self-published my first book, One Light One Love in 1993. Carol Adler's book provides you with excellent advice from her wealth of experience in the industry. Download Your Ebook Version of Do You Really Need to Write A Book? Sharon Kay is a gifted author as well as a spiritual teacher and a globally recognized bead artist.